Peja is the third city of Kosovo. The municipality has around 100.000 inhabitants. Serbians call the town Péc. The majority of the people have an Albanian ethnic background. Minorities are Serbians, Bosniaks, Roma, Ashkali and Egyptians. 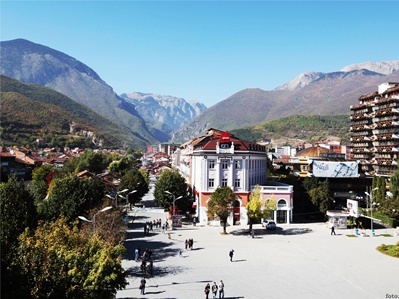 Peja is the hometown of Majlinda Kelmendi, who was the most successful judo player in world in 2014. The young lady is a big star in Kosovo. In 2016, she won a gold medal at the Olympics. Peja is the gateway to the Rugova Valley, an amazing nature park that is worth visiting. The park, free to visit, contains high mountains, waterfalls, streams, and a ski area. But also the city itself is nice to visit. Especially the old town in summer time is nice to walk through. Small streets, a bazar full of market stalls, and a beautiful old mosque are waiting for you. The ‘new’ center has a wide square, full with terraces, and a park. Although the Serbians are a minority in Peja, there is a very important Serbian Orthodox monastery. Actually, the complex of churches is the spiritual seat of the Serbian Orthodox Church. You can visit this monastery, which is rarely closed throughout the year. You will find the entrance on your left, just before entering the Rugova Valley. Parking in Peja is cheap, with an average of one euro a day. This is also the amount of money for a cup of coffee or a beer. A town close to Peja, Gjakova, is easy to access by car. Also neighboring country Montenegro is close. You can drive to this country via the mountain Rozaje. The border stations are on top of the mountain. Curious about how Peja looked back in 1969? You can see several very interesting pictures of Peja on this website about Kosovo. Are you interested in other cities of Kosovo? Check our Kosovo Cities page. I love Kosovo. I just can’t wait to visit it. By the way I’m from the United States of America and. I just can’t wait to visit pejä. I heard so much things about it from of my friends who live here in this city. I think that Kosovo is the most amazing place to visit. I always read lots and lost of articles about it.